This knife isn't all I wanted it to be. It just came back from Emerson. It's better than it was originally, but not as good as I think it should be. Fixing the pivot/lock is right up my alley, but the edge leaves me scratching my head. It's sharp. I have no doubt it will hack through anything that needs hacking through. But it seems crude, isn't as sharp as I can make it, and it just doesn't give me that warm fuzzy feeling. The left side is steep and coarse. The right side is blunt and finished with a finer grit. Would you use it as-is, or work on it immediately? I'm not keen on the notion of an asymmetrical edge in regards to angle OR polish. It just seems like a chore. In my head, it seems logical to do both sides just a little blunter than the left side is currently. If it's too delicate, on subsequent sharpening, I can dial it down a bit. 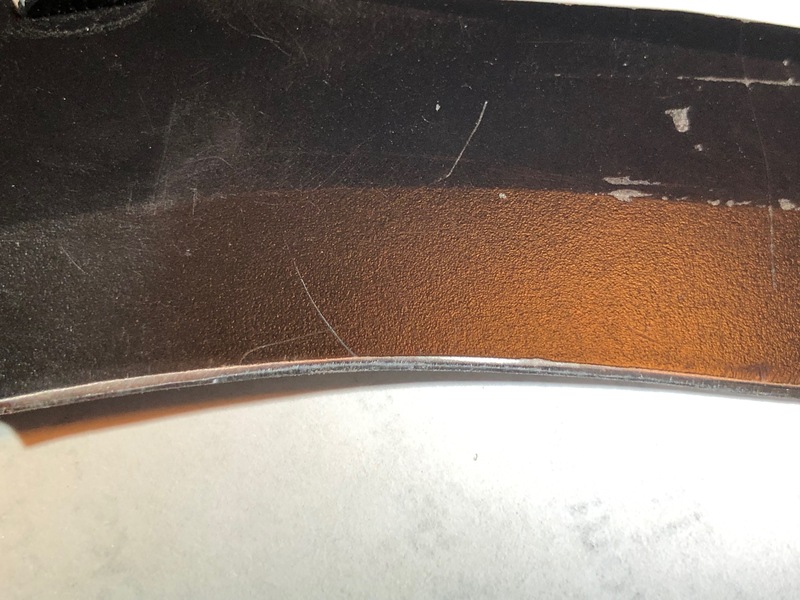 I didn't really understand much about knives before my Kimber Talk education, but now I am much more aware of the bevels and finish on the blade edge, etc. I have a couple of Chico's specially polished works of art, and they set a pretty high standard, so I have gotten fairly picky when I look at knives. Since you are much farther down the slope Rusty, I am sure you will be able to tune that knife up to your satisfaction -- Keep us posted! 'Iron, do you polish on an Edge Pro, or have a protractor-like device to target the bevel degree of the wider edge? Here's where I stick my unwanted nose into the mix. On an Emerson styled knife, I think of "a wide use tool of opportunity." If you consider that 15 degrees is a stellar kitchen knife, and +22 degrees enters the world of the camp axe, I would experiment with something around 18 degrees. As for the finish, I would recommend two knives. I carry a polished Prequel for food and finer slicing, simply because it can be taken apart by hand only to clean out the gravy under a faucet. 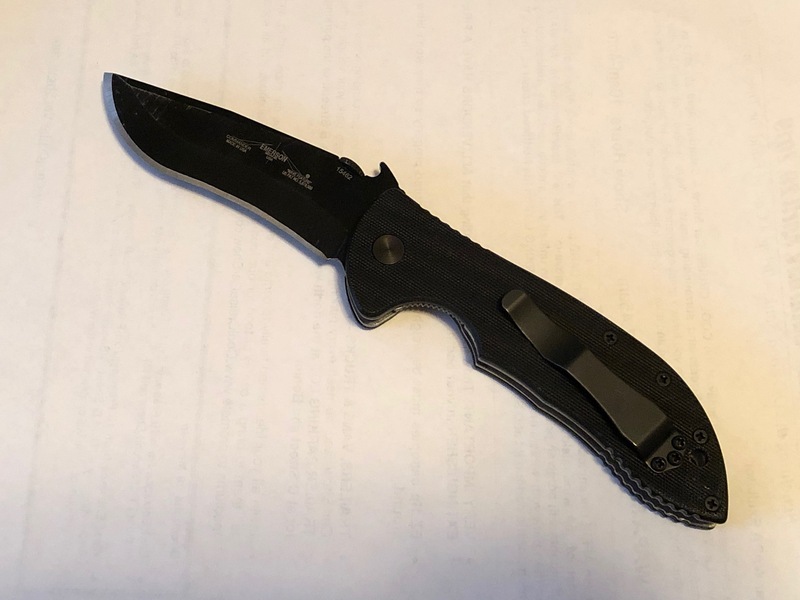 My EDC knife is now the Protech/Emerson collaborative, whose edge is "toothy" but smooth-ish. I went east/west with a 600 grit Schwartz stone. 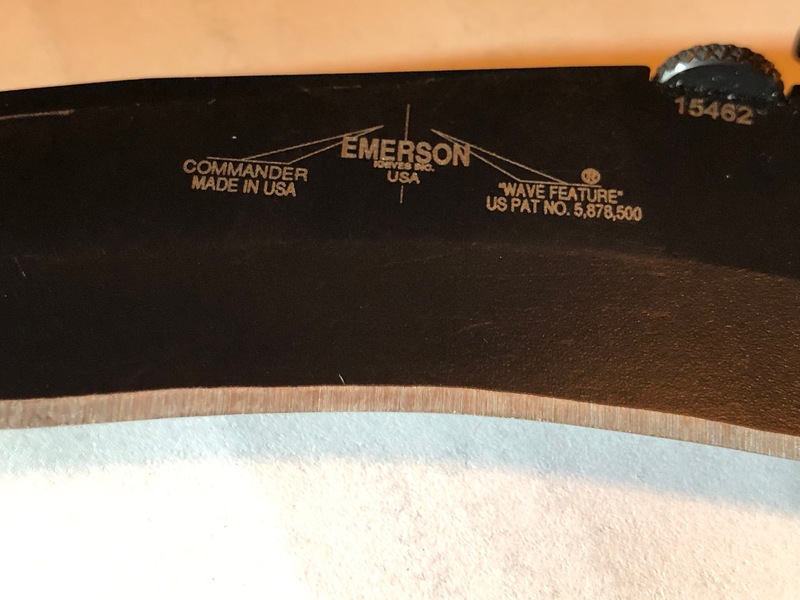 First thing is to make that edge uniform front to back and left to right--assuming that knife was ever a double bevel affair--it looks like a typical Emerson like design--all the bevel on one side only. If you don't start there it's all uphill. Then simply use light strokes to take off any errant burr, no matter how that bevel is designed. Use that edge for a day or two, and you probably find the edge too coarse. Ink up the edge, and polish with a 600 to 800 grit stone and then try that for a day or two. My guess is that you'll find 1,000 to 1200 grit a good edge for you blue jeans. Worse case scenario, put it in an envelope and ship it. I do have the complete set of stones for that design and alloy. I sent a copy of my opinion to Rob's PM. Yeah, most of the bevel is on one side, with a little bevel on the other. It came from the factory like that. I gave it a symmetrical bevel, pretty nice I might add, before sending it back to the factory so they could fix the pivot/lockup. They re-did the edge their way, so it's clear this is the way they want it. I'm gonna stare at it a little more before rubbing on it. I use a Chinese Edge Pro clone. It broke early on, but I've been fixing it as time goes on. I can do some pretty nice work with it, but I think life would be better with the real deal. There's a pretty steep ante to join the real Edge Pro game. I'm trying to decide whether I want the Professional 4 Kit for $700, or if I'm gonna be a cheapskate and get the Professional 1 Kit for $475. Any advice with that? If you mean "The Apex," you will become your own slave-driver. If you buy the "The Pro" model, you will be the richest polisher in California. That's because you'll be the only polisher in California. My cousins used to say, "Do you take the ugliest girl to the prom since she dances like you, or do you take the prettiest girl into the darkness so you can kiss like her?" Polish a knife for your no-brother-good-inlaw, and he will tell all of his bizarre friends. Women are better at math, then give all the ones and fives you made that day to your wife. Corvettes cost money. Thus endth the advice. The Professional comes in four different flavors, aptly named One, Two, Three, and Four. They differ from the Apex in that the Pro model comes on a gimbal. That's what I want. Pro 1, $475, includes two stones. Pro 2, $520, includes three stones, a ceramic hone, and some junk. 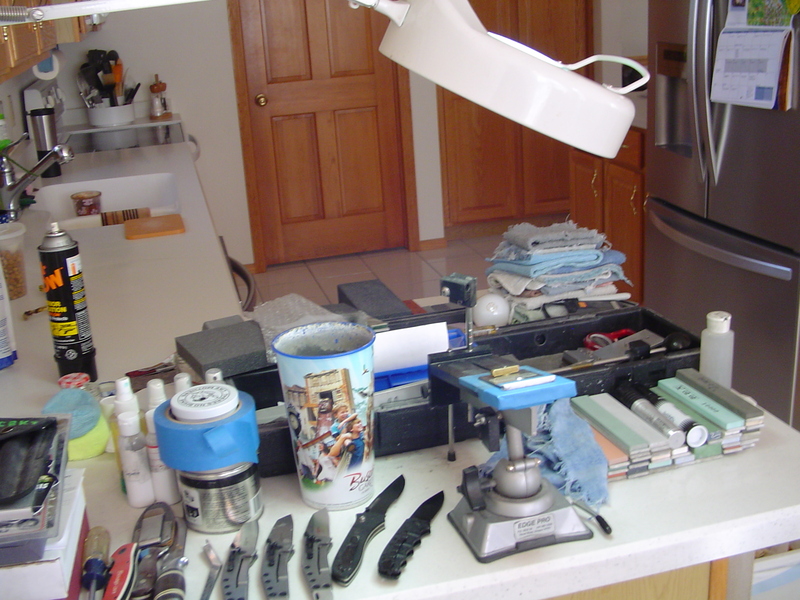 Pro 3, $570, includes five stones, polish tape, ceramic hone, and junk. Pro 4, $705, includes everything the Pro 3 has, plus the scissor attachment. Scissor Attachment alone, $135, also does chisels. So when you buy the Pro 4, you get the scissor attachment, three extra stones, and some other junk. I've used a couple Edge Pro stones (thanks, buddy! ), but I've not taken to them as I have to the stones I get from Ken Schwartz. And I'm not sure if I'd ever need to use a scissor attachment. I might use it on chisels, though. Right now I'm thinking that I just need to belly up to the bar like a man, and throw down a stack of cash on the best one available. So the next question would be, where should I go shopping to find the best price? So far, I haven't seen any discounts. "The damned fool spent most of his money on guns, beer, women, and knives. The rest he just wasted." CharlieW and Rob Babcock like this. Last edited by RustyIron; 04-13-2019 at 02:36 PM. I began small, then started my own business. I bought a second Pro model, which has it's own travel case. The original model is at my workstation. (See workstation below, click on picture to enlarge.). When jobs in beauty salons opened up, I bought the scissors attachment. Then I met Ken Schwartz and got every stone currently for sale in Japan. It's nice to get up when you want, go to the gym as long as you'd like and do your own projects as they arrive. Friends drop over because they know I'm home. RustyIron and Rob Babcock like this. The first thing I would do is understand why Emerson uses the grinds they do, how I intended to use the knife, and what grind best serves that use. It's more than just Ernest Emerson. The Japanese have been using a "chiseled edge" for hundreds of years. They call it a "yanagi." I just sold a Schrade single bevel to a barista.